This meal was a Friday at home date night meal I made for the Dragon. I found a good deal on pork fillet and wanted to do something special with ingredients we had on hand in our pantry and fridge. The result was a pretty easy meal to make over a glass of wine before retiring together to the balcony to overlook the city lights with our chimenea burning to set the mood. Toasted marshmallows made for a perfect desert. I literally licked my plate clean. This meal is A.May.Zing. The pork is moist and soft, the glaze is beautiful and the lentil base is a perfect compliment. This is a great special dinner at home/date night meal. Preheat oven to 200 degrees Celsius / 392 degrees Fahrenheit. Mix glaze ingredients while oven heats. Spray oil lightly over your pork fillet, then salt and pepper evenly on both sides. While the pork is resting, add spring onions, garlic and balsamic vinegar to the pan of blistered tomatoes. Stir for 1 minute. Add brown lentils to the pan, cook on medium to high heat until warmed through. Stir spinach through until wilted. 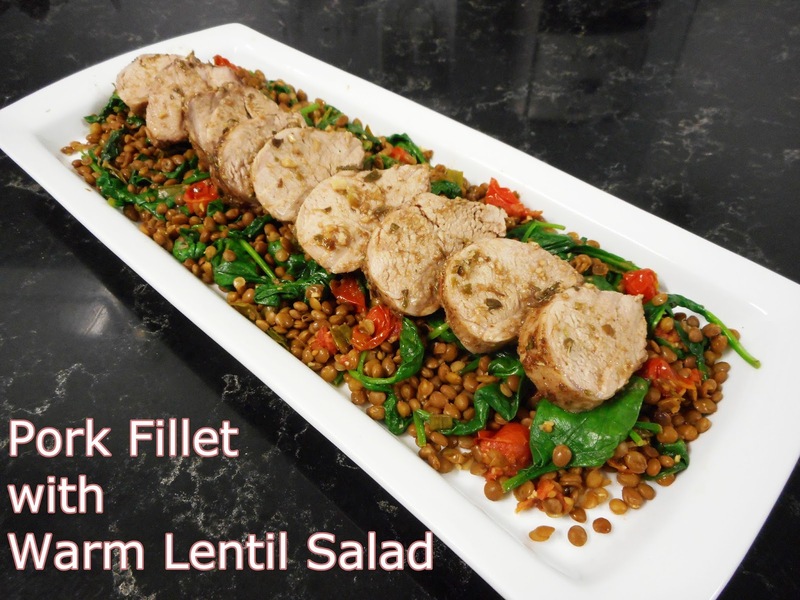 Slice pork and serve over lentil salad, topped with baking juices.